Home » budget-beauty » fragrance » guest post » perfume » reviews » Final Stocking Stuffer Suggestion:The €3.49 Scent That's Surprisingly Good! Final Stocking Stuffer Suggestion:The €3.49 Scent That's Surprisingly Good! Hey there, Keira Knightley! What are you at, you minx? Why are you wearing a taupe onesie and riding around on a motorbike Catwoman-on-Batman's-bike-style? Nah, I know what you're doing. You're telling the story of a perfume. And that's what the best perfumes do - without words they tell the story you want to tell about yourself. I can't remember when I first realised Chanel's Coco Mademoiselle was the perfume for me but I'm so in love with it I still get surprised and delighted by a waft of it, even though I've been wearing it for years. To me it is deeply fragrant, yet subtle. Exotic, yet friendly. Feel like a hug? Bring it in - this perfume won't rebuff you. However, be warned: the perfume will prick-tease you to within an inch of your life and then run away laughing over its shoulder. Oh wait, that's the Knightley ad again. Anyway, such is my devotion to the scent I was somewhat sceptical and trepidatious when the Fluffster asked me to test Lidl's Suddenly, Madame Glamour. But I was pleasantly surprised. First, it is an eau de parfum, which I didn't expect and second, it captures an oriental, exotic aroma which I love about Coco Mademoiselle. 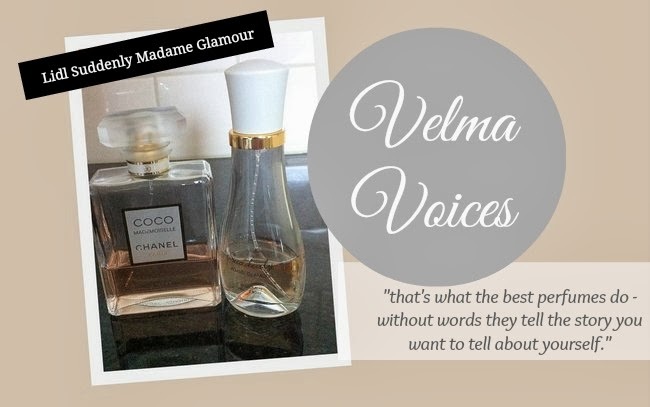 I tested these by alternating between one and the other over the course of about a month and the main tangible difference I noticed was a slight fruitiness to the Lidl scent that I don't detect in the Chanel perfume and that it was less long-lasting. (But at that price you can afford to reapply!) Also, I am always getting lovely compliments from people when I am wearing Coco Mademoiselle: work colleagues have asked me to write the name down so they could buy it for themselves or their partners. I didn't get this when I was wearing the Lidl scent. And of course, you're not going to get the full luxury of Coco Mademoiselle from Suddenly, Madame Glamour. For example, Chanel's beautiful, chunky, dressing table bottle with the opaque plastic lid is iconic and desirable, whereas the Lidl bottle is much more low key though handbag-friendly. The perfumes both have a lovely pale rosey pink colour. Because Chanel ain't exactly cheap, I often only buy it in the airport and so to conserve it sometimes substitute a less expensive perfume from time to time. Suddenly, Madame Glamour hits the spot. Not the real deal - but a great deal. 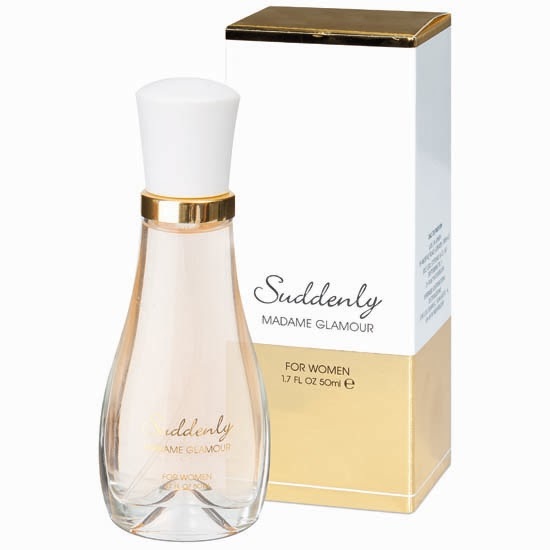 Suddenly, Madame Glamour retails at €3.49 for 50ml. 0 Response to "Final Stocking Stuffer Suggestion:The €3.49 Scent That's Surprisingly Good!"